When it comes to better grades, thinking matters. More accurately, the way you think matters, and can make the way you study more effective. The key is knowing the way you think. Freshmen students who took part in a study at Eastern University have shown an increase in GPA after understanding their unique thinking style. So what is the correlation between Thinking Style identification and better grades? Knowing the way you think can help you develop more effective and efficient study strategies. Basing your study habits on your natural thinking or “processing style” can help you work smarter, not harder, and give you strategies that are tailored to you. Studies in cognition and metacognition (thinking about how to think) have shown that there are specific and different ways each mind works when it processes new information. Some people process more concretely, while others, more abstractly. Some people use more literal thought processes, while others think in more theoretical terms. Which of the 4 cognitive thinking styles best describes you? • Intuitive: Feelings matter. If you like the instructor, you’ll do well. • Theoretical: If the class has a lab, don’t miss the Lab! It takes only minutes to learn some quick strategies that may help you make the best use out of the time you spend thinking and learning for academic or professional development. 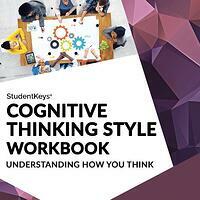 Find out your own thinking style with the Cognitive Thinking Style Assessment and Report. Each style’s characteristics are explained in more detail, and helpful tips for maximizing your strengths and minimizing the limits of your style of thinking are included. Did you know that both your cognitive thinking and perceptual learning styles work hand-in-hand for the benefit of improved learning and retention?